In the age of Facebook, Twitter, WhatsApp, and email, personal letters seem somehow out of date, or at least far from most people's everyday experience. 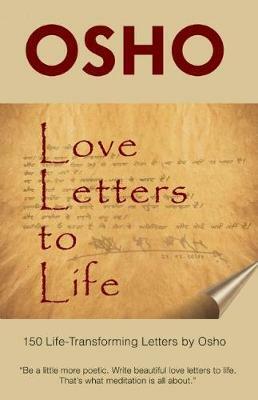 This book is a rare and unique collection of letters personally written by Osho to participants from his early meditation events. These are not letters to people and their personalities, these are letters to our souls. Osho addresses essential issues and concerns that arise on the path of meditation and self-discovery. The letters are encouragements to continue the process of meditation, and address subjects like Self-Acceptance, Wisdom, Consciousness, The Quest for Life, A Life of Freedom, Earth Is Our Home, Dropping Fear!, Dealing with Anger, Rebellion, and many more in a direct and penetratingly personal way. "If I write anything, I write letters, because a letter is as good as something that is spoken. It is addressed. I have not written anything except letters, because to me they are a manner of speaking. The other is always there before me when I write a letter." The OSHO works consist almost exclusively of the spoken word, addressed directly to individual people or larger audiences. These talks were recorded and then transcribed and published as books. This book represents one of the rare exceptions in the collected works of Osho, in which his written personal letters are published. Each one of these letters is like an condensed Osho Talk in haiku form. He would meet with these correspondents time and again at his meditation camps or while staying in their homes. This volume is a selection of his replies to their letters, queries, and calls for help. His words are intimate, incisive, poetic, playful, and loving. His encouragement to his correspondents to keep going on their chosen path of meditation and awareness while living, loving and working in the ordinary world -- to keep their flame of commitment burning brightly when he is not physically present -- can inspire whomever opens this book.